In 1951 A.Y. Jackson traveled to Great Bear Lake in the Northwest Territories, camping and sketching out on the Barren Lands, which he loved for their desolate and vast vistas. On September 7 he flew to Coppermine, the location of this fine oil sketch. A small settlement such as this was fascinating to Jackson, as was its setting in the boulder-strewn land covered with dwarf vegetation, mosses and lichens. As always, Jackson responded to the rhythm inherent in the landscape, emphasizing undulating ridges and furrows in the land with his fluid brush-strokes, echoed in the clouds in the sky. A palette of rich greens and blues is contrasted with earthy brown and brightened by touches of yellow. The short season of summer in the North would soon be over, and Coppermine is deftly caught by Jackson in the golden time before the turn to winter. 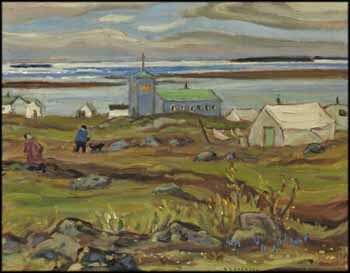 The 1951 graphite drawing for this oil, entitled Church at Coppermine, is in the collection of the National Gallery of Canada.